Right now I am waiting for water to boil so I can start canning some tomatoes from my garden. I don't have a big garden. This year I only have seven tomato plants. I plant enough to have all the vegetables we can eat during the summer with some left over to preserve for the fall and winter. Although they rarely last to the winter. 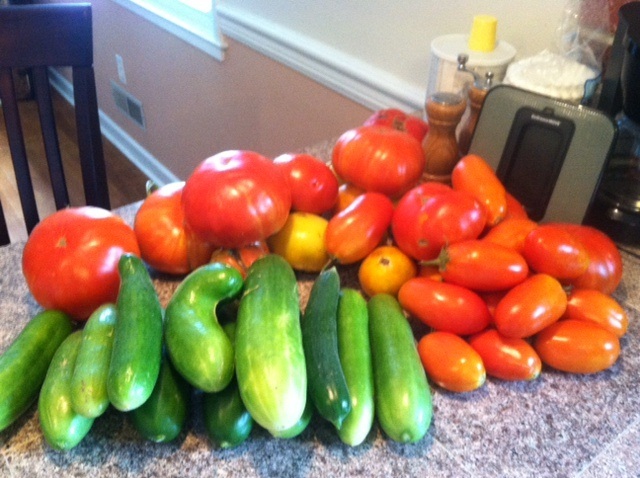 I don't garden to save money. In fact, I'm sure my produce ends up costing me more. I do it because I believe my produce tastes better than the supermarkets and I get a sense of satisfaction from being just a little self sufficient. It also builds skills that I might find useful down the road. America is a blessed country, but it is not immune to natural, political, or economic disasters. The day may come where knowing how to grow your own food is the difference between thriving and just surviving. I try to be as self sufficient as is practical. Now, I don't try to live off the grid or off the land, but if I can do it myself, I do. That is why I do my own car and house maintenance. I make my own furniture and do my own yard work. This is also one of the reasons why I hunt. I hope I never have to hunt solely to provide food for my family. (Especially since I'm so bad at it!) But I would like to have the skills to do so if necessary. I believe most hunters feel this way in the back of their minds. If something bad does happen, hunters will be the best equipped. There are thousands of web sites and books on preparing for disasters. I know people who have entire rooms dedicated to survival supplies. This is all good, but how many of these people actually know how to butcher a rabbit, syphon gas, or even build a fire? Hunters know and practice everything they need to survive. Every serious hunter I know is a hands on person. They fix their own plumbing and grow their own vegetables. It is part of who we are. Modern society has lost so much self sufficiency. When I tell people I'm canning tomatoes they give me strange looks. Few know how to preserve their own food. Some don't know how to cook their own food! I hope beyond hope that America continues to enjoy this blessed abundance. But it it ever fails, hunters will be hear to hold things together. The tomatoes are done for today. It took two and a half hours. I'm tired. Sure, I could have gone down the road and purchased the same amount of spaghetti sauce for about ten dollars. Most would think I wasted my evening, but I don't.